The field of Mobile’s flag is white. On a width of 6.5 units, a horizontal red stripe of 1 unit runs across the top of the field, about .5 units from the top edge, and a blue horizontal stripe of 1 unit runs across the bottom, about .5 units from the bottom edge. In the center of the field is the circular seal of the city, approximately 3 units in diameter and in effect, a seal within a seal. Around its outside edge is a gold ring on which SEAL OF THE CITY OF MOBILE, ALABAMA appears clockwise in black letters reminiscent of a 19th-century Barnum font. The letters begin about 7 o’clock and end at 5 o’clock. In the space remaining at the bottom of the ring, between “SEAL” and “ALABAMA” are three fleurs-de-lis, also in black. The field of the inner portion of the seal is also white. A smaller seal of about 1 unit in diameter, all in gold with black lettering and figures, is placed centrally in the lower half of the larger seal’s field so that the smaller seal’s top edge is very slightly above the field’s midpoint. The smaller seal also has an outside ring on which FROM ENCHANTING TRADITION curves clockwise over its top and ENDURING PROGRESS curves counterclockwise below. In the center of this smaller seal, in its upper half, appears MOBILE, and slightly smaller, immediately below it, ALABAMA. The words fill the top half of the inner field. In the lower half are several figures: A sailing ship and seagull, upper hoist; a bale of cotton, lower hoist; a tall building, upper fly; and a mill, lower fly. Below the smaller seal is a ribbon, also gold with black letters, with FOUNDED 1702 between the smaller seal’s outer edge and the inner edge of the larger seal’s ring. Arrayed around the smaller seal in the upper portion of the larger seal’s field are six partially furled flags forming a semicircle around the seal. The flags are (from the hoist): 1. France (the white semy-de-lis ensign, gold fleurs-de-lis on white, in use 1638-1790); 2. United Kingdom (national flag combining the white Cross of St. Andrew on blue with the red Cross of St. George on white, in use 1606-1801); 3. the United States of America, presumably of 1813, but generic in appearance since only four white stars of the blue canton and four red and three white stripes of the fly are visible; 4. the Confederate States of America (either the second [1863-1865] or third [after 4 March 1865] national flag, since only three white stars of the blue saltire of the red canton are shown, and a small portion of the white field at the hoist); 5. Spain, the red-yellow-red horizontal tribar (in use beginning in 1785); and 6. the Independent Republic of Alabama, after secession from the United States on January 11, 1861 (a portion of the blue field of that flag, with none of the design of it visible, in use over the capitol from January 16 to February 10, 1861). The flag of the United States is in the center and has an eagle as a finial; the other flags have spear finials. The flags represent the six nations that have governed Mobile: France, founding of Mobile and possession 1702-1763; Great Britain, 1763-1780; Spain, 1780-1813; the United States of America, 1813-1861 and 1865-present; the Independent Republic of Alabama, January 11 to February 10, 1861; and the Confederate States of America, 1861-1865. The figures on the smaller seal are explained by the city administration: The sea gull and ship are significant because Mobile is among the nation’s 10 major seaports, and the cotton bale was responsible for much of Mobile’s early growth and prosperity. The tall building and mill depict the many industries which have come to Mobile in recent years. Approved in a conference meeting by the board of city commissioners. Flag adopted: 4 December 1968 (unofficial). The Republic of Alabama flag depicted in the seal is double-faced, although all that can be seen is a portion of the blue field corresponding to the canton. The front side shows Liberty in a red sleeveless gown. In her right hand, she grasps the hilt of an unsheathed sword, pointed downward. She raises her left hand, holding a small blue flag aloft that has ALABAMA curved across the center of the field in gold above a single gold star. Above the female figure is a motto in gold across the top of the field: INDEPENDENT NOW AND FOREVER. The reverse side depicts a cotton plant ready for picking except for several red flowers. At the base of the plant, issuing from the roots on the fly side is an upright rattlesnake, facing the fly. Below, in gold, is another motto, NOLI ME TANGERE (“Touch Me Not”). Mobile did not have an official city flag until a design was suggested by Commissioner Lambert C. Mims, and this was approved in a conference meeting on December 4, 1968, by the Board of City Commissioners. No Ordinance was adopted, but it is a part of the Minutes of the meeting of December 4, 1968, as recorded in the book. The official City Seal, which is used on this flag was adopted as the City Seal in 1961 with only slight changes from a design used in the 250th anniversary celebration. The sea gull and ship are significant because Mobile is among the nation's ten major seaports, and the cotton bale was responsible for much of Mobile's early growth and prosperity. The tall building and mill depict the many industries which have come to Mobile in recent years. A resolution in August of 2000 was made to remove the Confederate Battle Flag from the official City Seal and replace it with the Third National Flag of the Confederate States of America. At www.cityofmobile.org is the coat of arms of the Historic Development Commission. The arms are mantled in gold with a golden cockle shell as a crest, attached to the mantling itself. The arms themselves appear to be a Spanish-style shield divided both horizontally and vertically into six small flaglets, if I may coin a phrase, three above the horizontal division and one inside each of the vertical ones. Each flaglet represents a country which ruled over Mobile from the time of its first European settlement to the present: these flags are, in the top row (a) the Bourbon lilies of France, gold on a white field; (b) the pre-1802 Union Jack of Britain; (c) the Castle and Lion of Spain (technically Leon and Castile), divided per bend sinister. In the bottom row is a flag which I do not recognize which appears to be a figure of a woman in white on a blue field with some golden objects on each side of her, which I take to be the flag of the short-lived Republic of West Florida. This is followed by a Confederate flag of a somewhat unusual pattern (I don't think I have ever seen a Confederate flag with a blue stripe in the fly before), and finally a contemporary fifty-star U.S. flag. The "woman in white" is the device from the so-called flag of the Republic of Alabama (1861), actually the flag donated to and used by the secession convention in January of that year. The obverse shows Liberty carrying a sword in one hand and a flag in the other. She's usually shown with a red dress, not white, but I'm not sure of the basis for that; remnants of the original are housed at the Alabama Department of Archives and History, and described and discussed in more detail at www.archives.state.al.us/referenc/flags/105107.html. This flag is also mentioned but not shown on the Alabama page. A local preservationist has given us the name of Jim Gray as the artist for the MHDC shield. Done in the early 1960s when there was no staff for the Commission and only scrapbooks were used. It is rumored that these scrapbooks were destroyed with the 1979 Hurricane Frederick wind and water at City Hall. The flags [on the MHDC Shield] represent the six governments which have ruled our city, beginning with the French in 1702, followed by the British and the Spanish. It was not until April 15, 1815 that President James Madison ordered that the town be seized for the United States; since he claimed Mobile as a part of the Louisiana Purchase. The first town charter was granted on January 20, 1814. In 1987 the city of Mobile, Alabama, adopted a flag for its own Mardi Gras celebration, which actually predates that in New Orleans--that is to say, the kind of Mardi Gras celebration with parades and masked balls conducted by "secret" societies and the crowning of kings and queens of carnival. Mobile considers the use of green by New Orleans a modern innovation; Mobile recognizes only purple and gold as the colors of carnival. Its flag is a horizontal purple-yellow-purple triband with a purple mask on the center below a strip of purple ribbon marked with yellow lozenges forming the shape of an M. Below the emblem [unfortunately] is the name of the city in purple letters. Source: www.ywcamobile.org. The page also shows the Mardi Gras flag of Fairhope, Alabama, a smaller city on the other side of Mobile Bay from Mobile itself. Although the photo appears to show the yellow stripe wider than the purple ones, it appears to me from the stretch marks in the upper hoist and fly that part of the photo is cropped. I've assumed a ratio of 3:5 and equal stripes in the image above. "1987 - The Mobile City Council officially adopts a Mardi Gras Flag for Mobile. The flag bears the colors of purple and gold, with a serpentine "M" floating over a traditional mask." By the way, this site dates the adoption of the New Orleans Mardi Gras flag and colors to 1872, which would have been when the Krewe of Rex (officially the "School of Design") was founded. A quick search for Mobile Mardi Gras flags finds you a newspaper that uses the existing flag as the icon for Mardi Gras news, a photograph of a variation used in a similar way, and this nice article showing the existing flag in the cloth: Cool Spaces: Carnival-ready cottage (February 2018). The flag in that article is apparently a new, slightly improved design as well, in that it has the charge in blue, rather than purple, and it got rid of the word "Mobile". ification.) The flag seen here does have unequal stripes, though not as severe as in the previous image. "Mobile, Alabama is the home of the original Mardi Gras celebration, predating New Orleans' renowned event. The YWCA of Mobile has commemorated the city's Mardi Gras history and heritage by designing a flag which has become the city's Mardi Gras symbol. Research determined that purple and gold were the original Mobile Mardi Gras colors (without the green associated with New Orleans), and these colors and Mobile's "M" in serpentine fashion highlight the flag. In 1987, after the efforts of many YWCA volunteers, Mayor Arthur Outlaw proclaimed this flag the official Mardi Gras flag of Mobile. Now, not only does the flag provide an important community service as a common logo for Mobile and its historic Mardi Gras celebration, but all proceeds from the sale of Mardi Gras flags support the non-profit children’s programs of the YWCA of Mobile Alabama, including the Tickle Days Homeless Daycare Program." So, the official flag was official because that way the proceeds went to a good cause. Unfortunately, according to Visit Mobile AL, over ten years ago the YWCA stopped operating. No mention is made of the copyright being passed on to another worthy cause, which leaves the old flag in a void. I can imagine the slight variations of the design, different colours for the charge and removal of the letters, are caused by having to avoid breaking the copyright, now that the original flag can no longer be legally obtained. In general, the variations really seem improvements. After months of meetings, conversations and focus-group testing with members of parading organizations, marching clubs, mystic societies and civic and municipal leaders, a new Mardi Gras flag and logo have been designed and finalized, according to a news release from Stephen McNair, founder of Michael Kraft LLC. "This project has been in the making for years," said McNair. "We are proud to offer the citizens of Mobile a design that slows for the uniformed branding and marketing of our most important annual cultural and tourist event. We believe the workshopped process of inviting community feedback was crucial for creating a design that truly represents all of Mardi Gras and the importance of Mobile as being the founder of the celebration in the United States." The purple and gold flag depicts tragi-comic jesters on either side of a crown-topped M, with the words "Mobile 1703" below. The city was founded in 1702, and Mardi Gras was celebrated for the first time in 1703. While New Orleans uses purple, gold and green in its Mardi Gras activities, Mobile's traditional colors are purple and gold only. "Mardi Gras in Mobile is Alabama's largest annual tourist event, so it's only fitting that we have a logo that can be used across the country to uniformly promote the celebration," said McNair. "Our primary goal was to create a design that everyone in Mobile could be proud to display as a symbol of our collective cultural and civic pride." 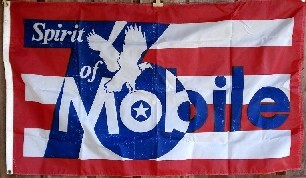 Offered on eBay a 3 x 5 feet flag from Mobile, Alabama celebrating the U.S. Bicentennial 1776-1976. Made in the patriotic colours of blue, white, and red, the flag reads "Spirit of 76 Mobile." On a red field are placed three white horizontal stripes - not touching the flag's edges - serving as background for a huge figure "76" in blue, situated in the hoist and not exceeding the white stripes; the place name "Mobile" rests on the upper part of the lowest of these, written white where appearing before the "76" and blue where appearing on red or white. Mobile's "o" and the roundel in "6" coincide, forming a white and wide-bordered blue disk bearing a white five-pointed star. For good measure the words "Spirit" (situated in the horizontal bar of "7") and "of" (somewhat lower down the diagonal bar of "7") appear in white and an American bald eagle, also white, apparently dropping from the upper hoist alights on the "o".